SpaceX plans to send its Dragon spacecraft to Mars as early as 2018, the company announced today — marking a major first step toward CEO Elon Musk’s goal of sending humans to the Red Planet. The company didn’t say how many spacecraft it will send, but hinted it would conduct a series of these Dragon missions and that it would release more details soon. In a tweet, the company indicated that the capsules would fly on SpaceX’s Falcon Heavy rocket, a bigger version of its Falcon 9; the rocket will launch the capsules to the planet to test out how to land heavy payloads on Mars. If successful, the endeavor would make SpaceX the first private spaceflight company to land a vehicle on another planet. SpaceX is sending what it calls the Red Dragon, a modified version of the spacecraft that the company uses to transport cargo to and from the International Space Station. The Red Dragon is equipped with eight SuperDraco engines that allow the capsule to land on solid ground, a technique known as a propulsive landing. The engines are meant to turn on during the Dragon's descent toward the Martian surface, slowing down the vehicle's fall and allowing it to land on ground in a controlled way. It's similar to how SpaceX lands its Falcon 9 rockets post-launch. Propulsive landings could be an efficient way to get large amounts of hardware down to the surface of Mars — something that NASA still hasn't figured out how to do yet. Spacecraft returning to Earth have a thick atmosphere to help slow down their fall, but Mars' atmosphere is just one-hundredth the pressure of Earth's, providing less cushion for incoming vehicles and increasing the likelihood of a crash. So far, NASA only knows how to land 1 metric ton of hardware on Mars gently. The agency is working on an inflatable lander that could potentially land more weight, but testing of the vehicle has run into a few snags. 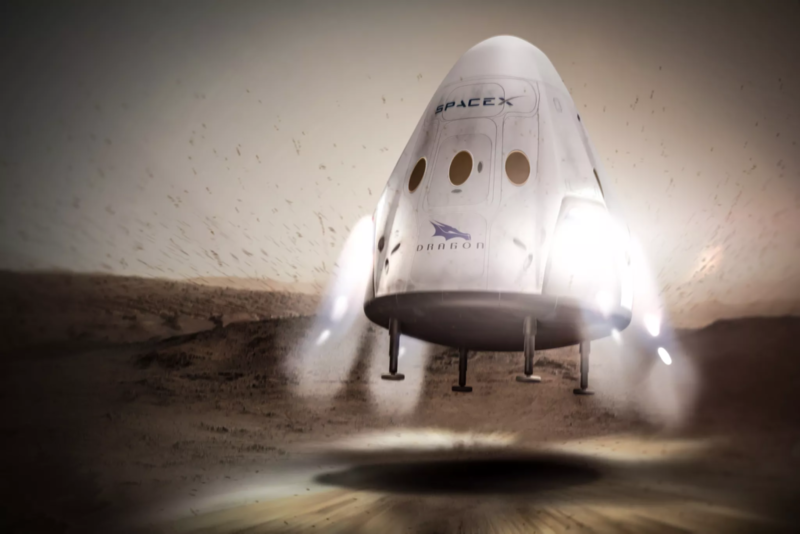 In 2014, NASA explored the feasibility of using SpaceX's Red Dragon concept to land equipment on Mars and determined that the capsule's landing technique could work. NASA also proposed the idea of using the Red Dragon to bring samples from Mars back to Earth, though SpaceX hasn’t announced plans of incorporating that idea into the 2018 mission. These Red Dragon missions will be an important precursor to SpaceX's long-term goal of setting up a Martian colony. Any human missions to Mars will require sending tons of equipment over first before people get there so colonists have all the supplies they need to keep them alive. The Red Dragon could be a crucial vehicle for transporting supplies to and from the planet. Musk has said that he will reveal the full extent of his Mars colonization plan this September at the International Aeronautical Congress in Guadalajara, Mexico, according to the Observer. There's still a lot to be done before the Red Dragon makes it to Mars. SpaceX has shown that its rockets can land propulsively, but the technique hasn't been demonstrated yet on the Dragon capsule. The company has used the SuperDraco engines to ascend the Dragon during a pad abort test, and the engines have been used to make the spacecraft hover, but not land. SpaceX plans to test out propulsive landing on a future Dragon cargo capsule, after the spacecraft returns from the International Space Station. And to get the Red Dragon to Mars, SpaceX will use its Falcon Heavy — a heavy-lift version of the company's Falcon 9 that's currently under development. The Falcon Heavy has yet to fly, but SpaceX is planning the first test flight of the vehicle for November of this year. That said, the test flight deadline has been pushed back quite a few times. If SpaceX pulls this off, the Red Dragon will be one of the largest things to ever land on Mars. NASA’s Curiosity rover weighed 1,982 pounds when it landed, but the Red Dragon will weigh five to 10 times more than any other vehicle landed on Mars, according to SpaceX. Plus, the mission would be privately funded, making it the first commercial vehicle to land on the Red Planet. SpaceX did not go into cost specifics for the mission, though. Landing the spacecraft on Mars is just part of what SpaceX will need to start a colony there. The company will need to develop an interplanetary transport vehicle, surface habitats, life support systems, and much, much more. But if SpaceX meets this ambitious 2018 deadline, it suggests the company may be further along than even NASA at putting people on the Red Planet. For the past few years, NASA has been touting its Journey to Mars initiative, which entails sending astronauts to our planetary neighbor. But NASA won’t be sending people to Mars until the 2030s, and the Journey to Mars ideas has been criticized by politicians and industry experts for lacking a cohesive plan. NASA's next robotic trip to Mars, separate from the Journey to Mars plan, will involve landing a new rover on the planet in 2020.